The marine safety education trailer. SKIPPERS heading to sea north of Perth are being reminded to check they have in-date flares and ensure all safety gear is in good working order and readily accessible in an emergency. 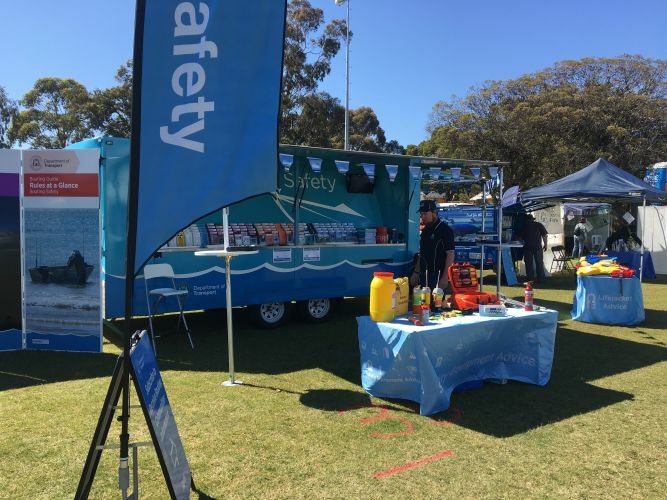 The Department of Transport issued the reminder as it prepares the marine safety education trailer to visit Lancelin and the Coral Coast early next month, providing tips on safe boating. Safety education manager Laurie Adams said the high number of vessels going to sea with out-of-date flares was a concerning trend identified during safety compliance checks conducted over summer from Lancelin to Geraldton. “In-date flares are required safety equipment for boating in open waters and skippers who fail to carry them are risking their lives,” he said. Mr Adams said officers would be advising skippers and passengers to take the 30 Second Challenge, which tests their readiness for an emergency response on board a vessel. It tests if people can gather flares, EPIRB (Emergency Position Indicating Radio Beacon), make a radio call and don a lifejacket in 30 seconds. Mr Adams said the department would also bring its Old4New lifejacket upgrade to the area, so people could exchange old, damaged, obsolete or foam filled lifejackets with vouchers for new ones. The trailer will be at the Jurien Bay Volunteer Marine Rescue Group tower from 2pm to 5pm on Wednesday, May 2 and the Leeman Sea Search and Rescue headquarters from 9.30am to 10am on Thursday, May 3. During Geraldton stops, it will be at the town ramp from 8am to 9am on May 4, the Caravan and Camping Show on May 5 and 6, and at Geraldton Volunteer Sea Rescue Group from 5pm to 6pm on May 7. Officers will also be visiting schools in the region. Visit www.transport.wa.gov.au for more information.